News & Blog New manufacturing facility - coming soon! We’re delighted to announce that we’ve recently secured an additional manufacturing facility. 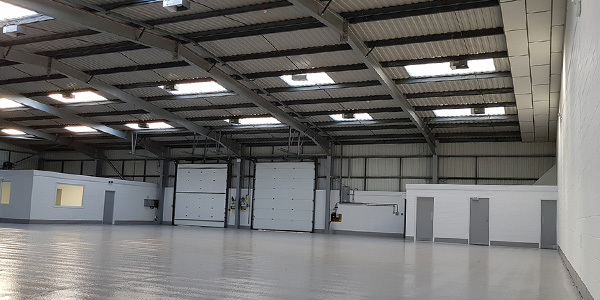 The unit, very close to our base in Olney, gives us an extra 11,000 square feet of manufacturing space, which we’ll be putting to good use straight away. Half of the space has been dedicated to our Incarnation secondary glazing, while the second half will be used for our brand new in-house finishing facility, plus we have some other plans as well. As a result we’ll be able to free up a significant amount of space at our main factory in Olney, which we’ll use to increase both capacity and efficiency. We’re currently in the process of fitting out the new factory unit, with the aim of bringing it online before the end of April. The new unit adds to the three we already have – our original 20,000 square feet factory plus the two 5,000 square feet units we’ve already expanded into, giving us a total of over 40,000 square feet. We’ve undergone significant controlled growth over the past five years, and this new unit allows us to continue on that path and continuing meeting the ever-growing demand for our sash windows and secondary glazing.